I didn't grow up eating berries. The only berry I remember having in Brazil was strawberry. Raspberries, blueberries, blackberries were either not available or incredibly expensive. So I look forward to cook with them during the summer months when they are in season. I like them all, although I have to admit I still prefer the tropical fruits better. This is a small cake, and I like to have a slice when it's still warm, with a scoop of vanilla ice cream. Because it's a small cake, it's important to use a small baking pan, or the cake will be pretty short, like mine. The original recipe suggests using a 5 1/2 inches souffle dish, I used a 6 1/2 inches. If presentation doesn't matter so much to you, use whatever you have in hand, the cake will taste great regardless. My cake didn't turn out as tall as the one on the picture, I wonder if it is because I used a 6 1/2 inches souffle dish instead of a 5/12 one. That reminds me of something else: This is a small cake. If you plan to make it for a large crowd, consider making two of them. Lastly, my cake was done after 40 minutes. Heat oven to 350 degrees F. Butter a 1-quart, 5 1/2-inch-diameter souffle dish. Pour 2 tablespoons of melted butter into the souffle dish. Sprinkle 3 tablespoons of brown sugar over butter. 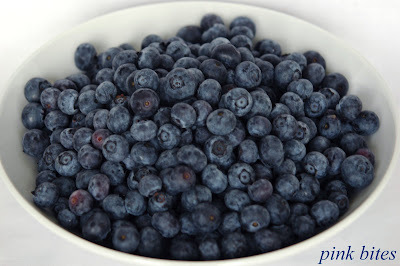 Scatter 1 cup blueberries over sugar. Set aside. In a medium bowl, whisk together flour, baking powder, and salt. In another bowl, whisk together remaining 2 tablespoons butter, remaining 1/3 cup brown sugar, and the egg. Whisk the milk into the egg mixture. Add flour mixture; whisk until batter is smooth. Pour half the batter into the souffle dish. 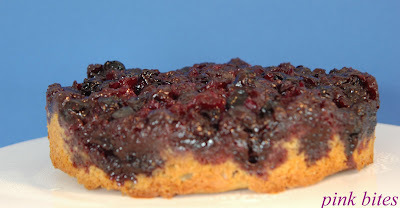 Sprinkle remaining 1/2 cup blueberries over batter. 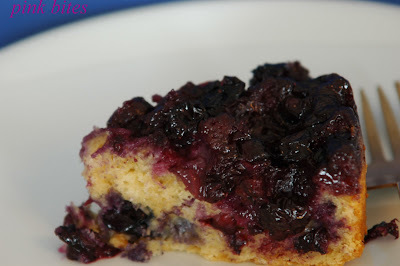 Spread remaining batter over blueberries. Bake until a cake tester inserted in the middle of the cake comes out clean of batter, about 45 minutes. Immediately invert cake onto a serving dish.